Since April 2015, Rose and Frederick White have sought to provide a perfect retreat for family holidays, birthdays, anniversaries or just a quiet break away. Originally a Victorian family retreat, Hudson's Bay now houses six bright and tastefully decorated apartments in a great level location close to the beach, shops, buses and trains. 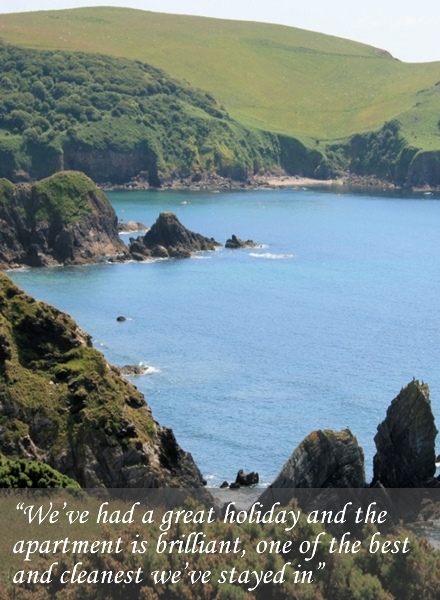 This, along with a friendly approach and a high standard, has resulted in many guests returning year on year. The local area provides a varied range of fantastic days out all year round and we are always more than happy to help visitors plan excursions and local walks. Our self catering apartments are ideally located for lovely coastal walks and we are only 3 minutes from the South West Coast Path. The coast path can be accessed at several local spots and leads through some of the most spectacular coastal scenery in the country.